By Thomas D. Davies, Jr. AIA and Carol Peredo Lopez, AIA, PVA Publications. Soft cover. $28. ISBN 0-929819-18-7. 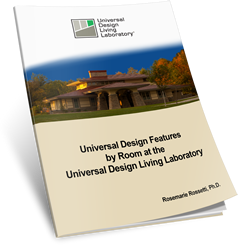 When I’m looking for an answer to a question about a specific dimension for a universal design feature in a home, I pick up my copy of Accessible Home Design. This book is comprehensive, taking the reader through the front door and exiting them out the rear door into an accessible garden. There is considerable detail and illustrations included to show various ways to create ramps, bridges, and sloped walkways for wheelchair users. This book contains a chapter on elevators, stair lifts and vertical platforms to help families find solutions for two-story access. The chapter on kitchens provides some thoughtful floor plans, as well as advice about selecting and placing the appliances. There are two chapters on bathrooms—one helps in positioning the sink, toilet, shower and bathtub on a floor plan. The other chapter helps in selecting plumbing fixtures such as toilets, vanity basins and sinks, as well as the design of a roll-in shower. If you have ever wondered how to select and install a grab bar, look no further for the answer. 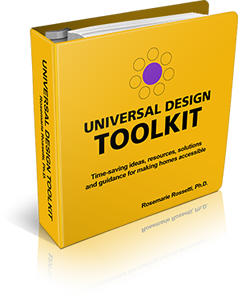 There is considerable detail in this chapter that any remodeler or builder should be able to follow. The chapter on doors will provide lots of options to make sure that you have doorways that are large enough, and level enough for wheelchairs. This book is packed full of ideas. It features attractive photos of functional projects that illustrate common design solutions to accessibility issues. The co-authors have provided the necessary technical information to enable an architect or builder, who may be less experienced in accessible design, to plan and execute an accessible project. The book also provides information that will help homeowners make product selections. I wanted to learn more after reading this book, so I contacted Carol Peredo Lopez to go beyond the book’s covers. She told me that both authors are architects and they worked on this second edition for two years. Thomas Davies has his own architectural practice in Annapolis, Maryland. He also wrote the Department of Veterans Affairs Handbook for Design: Specially Adapted Housing in 1978, which many are still using today. Lopez is Director of Architecture for the Paralyzed Veterans of America (PVA). Lopez initially learned about accessibility in the early 1980’s when she designed accessible commercial facilities. It wasn’t until 1991 that she had a client ask her to design an accessible addition to a home. The one-to-one discussions about the design with her client were an eye-opening experience. Her client’s candid discussions about his daily activities and needs made Lopez realize that everything she thought she knew about accessibility was merely the surface of what she really needed to know. Working for PVA offered Lopez the unique opportunity to consult with and advise hundreds of wheelchair users about home modifications. Such interactions gave her greater understanding of common accessibility problems and insight into the most appropriate design solutions. This 8 ½” x 8 ½”, 148-page, paperback, full-color book was released in 2006 by PVA. Many members allowed their homes to be photographed for this second edition. Practical design experience gained through working with these and other members, in addition to extensive research, has given the co-authors a unique perspective into meeting the accessibility needs of all homeowners. If you have questions for the co-authors, contact them at: [email protected] To order this $28 book, contact the publisher, PVA Publications, at 888-860-7244. It is also available through amazon.com.